The Canon PowerShot G1 X Mark III joins Canon's G-series range of high-end compacts as the flagship camera for enthusiasts and professionals. Boasting a large APS-C 24.2MP sensor, Full HD recording, a 3x optical zoom lens (24-72mm f2.8-5.6), and Dual Pixel CMOS AF, the Wi-Fi enabled G1X MK III packs superb DSLR image and movie quality into a stylish, lightweight body that's easily portable. 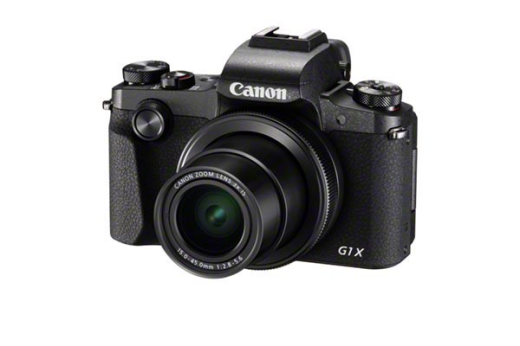 The G1 X Mark III features a unique blend of DSLR speed, quality and resilience with PowerShot lightweight handling. Ideal for photographers looking for an 'all-in-one' alternative to a DSLR as a photographic companion. The G1 X Mark III is engineered to deliver on every level and features Dual Pixel CMOS AF for assured and responsive focusing plus 4-stop stabilisation to safeguard handheld shooting. The PowerShot G1 X Mark III marks Canon's first PowerShot camera to feature the Dual Pixel CMOS AF system, which offers incredibly fast and precise autofocus that stays locked onto your subject, even if your subject is in motion, for both photos and videos. Equipped with phase-detection, this advanced Canon technology uses 24.2 million sensors to quickly determine how far away an object is and where the lens should focus, and is available while using the electronic viewfinder and when using Live View on the rear screen. These pioneering Canon technologies gives users a massive advantage when recording decisive moments. Shoot incredibly detailed 60p movies in Full HD and achieve smooth, steady footage even when running thanks to 5-axis Advanced Dynamic IS. The large sensor brings cinema-style footage while Dual Pixel CMOS AF delivers smooth and precise focus transitions with super-accurate subject tracking. Manual movie mode lets you adjust settings and focus via the touch panel LCD screen. You can do this even while using the viewfinder to express your vision your way however you shoot - all from a powerfully compact camera. Easily capture picturesque Time-Lapse Movies with intuitive settings that help determine intervals and exposure. Use the G1 X Mark III’s Bluetooth technology to control the camera remotely and track your journey using GPS via Mobile, plus connect via Wi-Fi to a variety of smart devices. Expand creativity via an optional waterproof housing and use creative modes to capture the world in unique and engaging ways. To expand the PowerShot G1 X Mark III camera's capturing capability to more places and situations, the camera is compatible with an optional waterproof case and lens hood. From fun portraits in the pool to colorful shots of sea life on a coral reef, the Waterproof Case WP-DC56 enables full operation down to 135 ft./40m underwater. Out of the water, the PowerShot G1 X Mark III can use the Lens Hood LH-DC110 to help control ghosting and flaring that can occur in bright sunlight, and help guard against scratches and smudging on the lens surface.